Love him or hate him, you can’t deny that Jay Z is a super savvy businessman with a hint of swagger—maybe a bit more than a hint. (I’m in the love camp, myself.) As a musician, he boasts a record-breaking discography and sold-out tours—including a recent mega tour with wife Beyoncé, which was filmed for HBO. His entrepreneurial projects over the years have included streaming music service Tidal, the 40/40 Club chain of lounges, ownership in several sports teams, the Rocawear clothing line, and much more. Forbes estimates his net worth this year at $550 million. “Jay Z” is a household name with what amounts to an entertainment empire. Clearly, the man knows what he’s doing. Building your brand isn’t that different from launching a music career. Like a musical artist, you start out as an unknown, looking for an audience. Once you find your audience, you want to grow it and keep loyal fans coming back for more. You’re like Jay Z, but just a little different. Let’s roll with this. 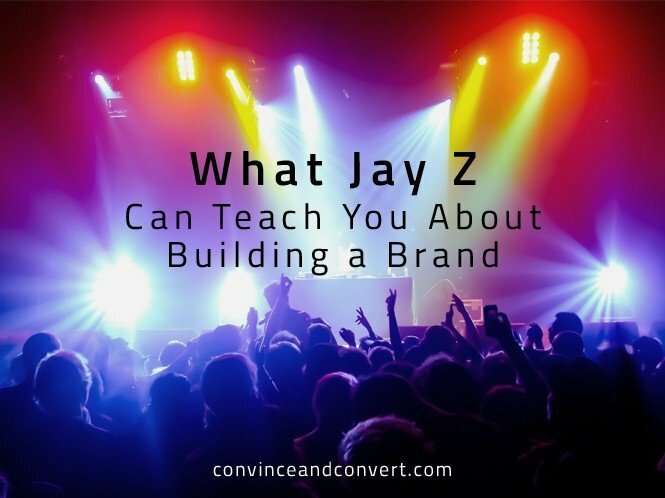 Here’s what you can learn about building a brand from music artists like him. Every piece of content you create—blog post, Slideshare, infographic, video, even conference presentation—is like a musical artist’s new single or album. A musician has something to say, something to share with their listeners. Frequently, that message is intensely personal, providing an insight into the artist’s life. Every element of a successful song contributes in communicating the artist’s message. In the same way, you should carefully consider your message and how best to communicate it to your audience. The type of content, the wording, the visual elements, and the channels where you promote it should all support your message. Develop your own unique voice to say what you have to say. Your job doesn’t end once the content is finished; you need to get out there and promote it to reach (and engage) your audience. Artists do major press tours: They go on morning shows to promote a concert, they do radio interviews, or in Jay Z’s case, they hit up late-night talk shows. Artists don’t just show up and sell out Madison Square Garden, or host Saturday Night Live. It doesn’t work that way. In your case, social media is the most effective platform for you to get your message—your content and, ultimately, your brand—out to your audience. Be an advocate for your brand whenever and wherever possible. Jay Z has been open about his 12 year business plan. Nothing is haphazard; every step is strategically considered. There have certainly been ups and downs, but Jay Z has used the downs to redirect. He thinks big. He’s not just concerned with the lifespan of his own career; he’s attempting to change the status quo of rap itself by bringing longevity to it. Think of building a brand like building a hip-hop empire. Like Jay Z, you’ve got to think several steps ahead. Consider how you can consistently scale what you’re doing now into the future. View your missteps or disappointments as opportunities to reevaluate and respond accordingly. It’s the little failures, the “near wins,” that actually drive us towards achieving the greater goals. Back in the late ‘80s and early ‘90s, Jay Z made a name for himself appearing as a guest artist on other rappers’ tracks. When he couldn’t get a record deal, he sold CDs out of his car. He slept on the floor, begged to open for other acts, and hustled. Today—even with his immense success—he’s still one of the hardest-working guys in entertainment. Building a brand isn’t something that happens overnight. It takes a lot of effort over a long period of time, with a lot of smart choices along the way. Consider what organic efforts you can put to good use. Focus on audience and execution, research the latest best practices for web design, scale your best channels, and grow your email list. Pound the digital pavement to develop name recognition. Don’t put time or resources into promoting crappy work. How do you know when content is crappy? First, make sure that you have truly invested the time and effort your content deserves. A musical artist starts each track from an idea of a lyric or hook, then expands that into a fuller song skeleton, builds it out layer by layer, tweaking and refining until it’s just right. In the same way, your content needs to be fully planned out, developed, and polished before you even think about sending it out into the world. Then run the most polished version you have by a test audience of 20 to 30 trusted colleagues, and ask for feedback. If a majority of them like it as is, a majority of your audience probably will too. If they have suggestions or questions, incorporate those into your next attempt and ask for another round of feedback. Test with your audience and make tweaks. Look for the hit singles in your catalogue. If a strategy or piece of content is unusually successful, see what you can take from that into the future—repurposing it or scaling it up. Not everything you create will go platinum. Most artists write twice as much (or more!) music than what they choose to use in an album. If you write something that doesn’t resonate with your audience, let it go and try something new. Do what you do best, without trying to please everybody. Jay Z’s not making music for jazz enthusiasts or opera aficionados. He knows his audience. And he delivers. Reach out to your audience—the people who want to hear your individual voice—with branding and content that shows you understand their needs. And make sure that you listen as well: Your audience wants to see that you are responsive to what they want. Measure your efforts to see what’s working (and what’s not) to engage your unique audience. Nobody—not even Jay Z—succeeds without a huge amount of work. It’s not easy for anyone. Part of the process of building a brand, whether that brand is a company or a rap mogul/entrepreneur, is struggle. When you see your on-the-upswing competitors getting sweet speaking gigs or glowing write-ups, try not to view them with jealousy or insecurity. Remember that they are learning, experiencing missteps, and figuring it out as they go, too. They are also putting in the work and the time. Use your competitors’ successes to drive and inspire your own. Colleagues who are seeing big career payoffs because they are five or ten years ahead of you can provide a blueprint for you to riff off. What are their most effective strategies? What are they doing that’s going well, but could be even better? What are their failures? Everyone can benefit from having a mentor—just look at Jay Z and his mentor Jaz-O, who gave Jay Z his earliest guest artist spots (and inspired his stage name). Those colleagues who got their start a few years earlier than you are perfect choices for mentors. With a few extra years under their belts, these colleagues can offer their experience and expertise to help you. Relationships with your peers and with counterparts across related industries are just as important. As you network, allow genuine relationships to develop gradually, nurturing them with consistent effort over time. Be generous. Do more favors than you ask for and reciprocate any you receive. Build your own entourage: a network of peers you can trust and who trust you to have their backs, too. Jay Z has collaborated many times with fellow rappers and hip-hop artists who have the same or a very similar target audience. But by occasionally partnering with an artist outside his own genre (Alicia Keys, Fall Out Boy, and Panjabi MC, to name just a few), Jay Z doubles his listeners—and creates some seriously sick tracks. The lesson here? Don’t just go to the most obvious sources when networking or collaborating; reach out to those whose audience doesn’t overlap 100% with yours to increase your visibility. Building your brand takes the same kind of long-term effort and thoughtful development as building a music career. But with a level of focus and ingenuity, it can reap the same kind of longevity. Welcome to the grind. With over 15 years of experience in strategic planning, digital marketing, and consumer insights, James has both the background and the dynamic vision to move brands forward in their journey to create compelling digital experiences, connect with customers, and engage in lasting consumer relationships. An industry veteran and expert in customer experience frameworks, lead generation attribution, audience/channel amplification and brand building, James empowers audiences with actionable takeaways to make their digital efforts relevant to their unique consumer base.